Tuttosport are on Monday the most confident they’ve been to date on Aaron Ramsey becoming a Juventus player. The Turin club had been pushing the potential transfer for months, probably going back to just after the summer window had closed, and now they believe everything is in the process of happening. 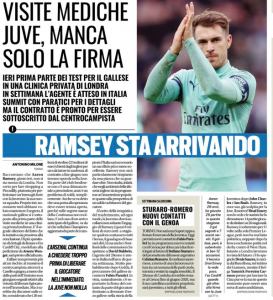 Ramsey is said to have gone through the first stage of a medical with Juve officials in a private London clinic on Monday, and they add ‘only the signature is missing’. Once he moves to Juventus, it’s explained the Welshman will be earning €8m a season after tax if all the bonuses are met, his basic wage will be €6.5m after deductions. At the latest, the Wales international is expected to arrive at the club in June, but a January move isn’t ruled out. For that, Juve would have to see signals from Arsenal that they’re interested in discussing such a switch, and it’s explained the Gunners asking for £20m simply won’t be entertained in Turin. A few days ago there was a rumour circulating in Italy that Mehdi Benatia could be sent to the Emirates as payment, although that isn’t covered today.